Your team is using Docker, but are they at a pro level? Ok, it kills me to admit this as a devoted and successful DIY guy, but when it comes to using Docker for your day-job, you probably need some good old-fashioned instructor led training to become professionally competent. Yes, for the first time in a long time I have run into a technology platform where structured classroom guidance from "the source" is not just helpful, it appears to be critically important for software professionals. I make this observation based on surveys of students who have attended Docker training. With very rare exception, the Docker training students admit to a blind gap in their platform knowledge before coming to Docker training. The "blind gap" is best described as not knowing what you do not know. The incoming students believed they knew Docker pretty well before the class started, because they spent time using a variety of self-guided learning resources, including Docker's self-paced tutorials to learn about the container platform. However, by the end of their instructor led Docker class, my routine survey yields a new perspective - they didn't really know Docker before the class. Early this year I became a Docker instructor and consultant as a way for me to stay on top of the latest developments in the Docker community, especially the best practices that could help our clients to more effectively adopt container technology. So I was a little surprised at how valuable these training classes are for really understanding the platform. Therefore, while I know this conclusion appears to be self-serving, I assure you it is also completely true. 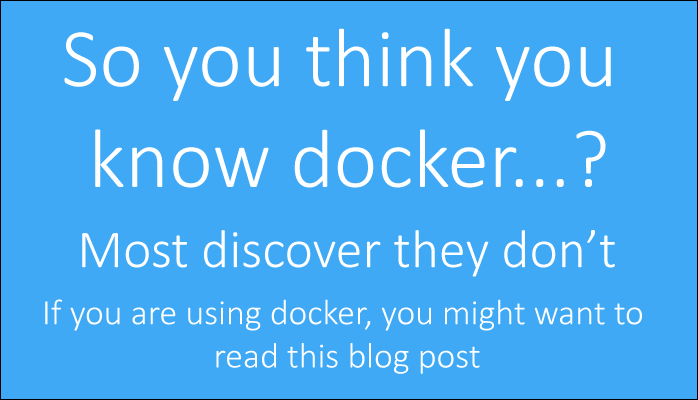 but it turns out I didn't"
but now I actually understand it"
Why is Docker harder to learn? I suspect the gap is related to Docker's fast moving, community driven technology platform. The side-effects of this high-velocity community include: quickly outdated reference materials, possibly misleading blog posts, stale tutorials and highly opinionated training materials base on old products. Are these "blind gaps" really a big deal? Realistically, these knowledge gaps could cost your company a lot of lost time, security exposure and platform instability. How to manage, secure and script container networks on a single node or in a container cluster. At least take the first 2-day Docker class. Docker calls it "Docker Fundamentals", but it really should be called "Docker Foundations for IT professionals". This will give you a much better understanding of the Docker CE platform capabilities. You can take the class by itself or as a part of class bundle. However, please don't skip the Docker Fundamentals class before taking the Enterprise Developers or Enterprise Operations class, because you will miss a lot. and use the promo code "AuthenticDockerTraining" to save 25% off of your ticket. Mark Panthofer is the Vice President overseeing NVISIA's Technology Centers in Chicago and Milwaukee. He started his career with NVISIA in 1996 and spent most of his career in the field as a leader in NVISIA's service delivery organization. After more than 20 years as a computer engineer, he enjoys exploring and applying the latest software technologies as the leader of NVISIA's Technology Center. Mark is also an Accredited Docker Consultant and Instructor.